For those who use them, Handicaps are very common in the game of darts. 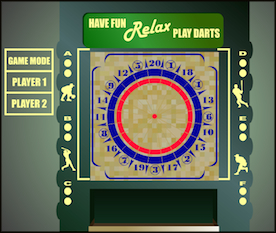 But, if you've never been exposed to a "handicapped dart game", it can be quite confusing at first. Basically, it is a way to find the appropriate amount of points to award to the lesser shooter to create a competitive game. That's it - it's the answer to "How much should we spot this guy to make the game fun?". And it is based off of how many points you typically score verses what they typically score. So, if I throw a 35 average, and Mark throws a 23 average I am 12 points better than he is. Handicaps run on percentages. A tournament may be a 75% handicap event. If i'm 12 points better than Mark, 75% of those 12 points is 9 points (12 points X .75). That means I would be spotting Mark 9 points in our game. It's really that simple. What's the difference between our averages, "times" whatever the Handicap is, and you get the "spot". And this is a VERY Popular way to run a tournament. I've run several two-man handicap events, and I'm sure you can have as many players per side as you like. Simply take the TEAM Averages, and then apply the handicap to the difference to find the "spot". I've seen flyers for tournaments that ranged from 50% to 80% handicaps, and I've heard of a League that runs a 90% handicap. So the number you can use for the handicap can vary greatly. I would suggest you go to the American Darts Database to find the averages to work with. There you will find the Official ABDA averages of over 3,000 shooters, and you won't have to worry about someone trying to sneak in an inaccurate average for the tournament. The only other thing I want to mention is that we had been running tournaments without any handicap for so long that there was some resistance to the idea at the beginning. Players thought that it was unfair to "reward players who don't practice". It only really took one tournament to change people's minds. What the system did was give less skilled shooters, AND better shooters a chance to COMPETE with each other. And when you are setting up a day (or night) of darting, if you have good competition all day, people are going to have fun!